The Russian government has signed major nuclear cooperation agreements with Saudi Arabia, Egypt, and Jordan since the start of this year, increasing its influence among traditional U.S. allies in the region. In June, Russia closed a major deal on nuclear cooperation between Russia and Saudi Arabia. Since the end of the last decade the Saudis have been implementing plans to construct as many as 16 commercial nuclear power plants. The Saudis have signed agreements with other nuclear nations, including the United States, France, China and Argentina, to help construct the reactors. Russia is now expected to play a sizable role in operating the nuclear plants, which are still to be built. The Saudis have indicated that a nuclear program will free up oil reserves to be used almost exclusively for foreign sales that generate hard currency earnings. In February, Russia and Egypt secured a preliminary deal in which Russia signaled its willingness to assist Egypt in building its first nuclear power plant. 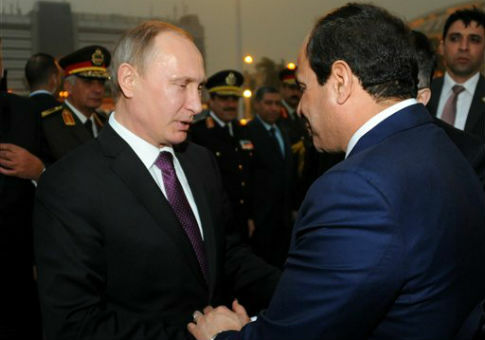 The agreement was announced during President Vladimir Putin’s February visit to Cairo, during which he also solidified Russia’s overall political and trade relationships with his Egyptian counterpart, President Abdel-Fattah el-Sissi. Current plans call for the power plant to be built near the northern Egyptian city of El Dabaa. Russia, which has extensive experience with nuclear energy, has offered to provide training and nuclear-related research for Egyptian engineers. Shortly thereafter, the Jordanian Atomic Energy Commission and Russia’s Rosatom, the state-run nuclear energy corporation, agreed on a plan for the construction of Jordan’s first nuclear power plant. Under the agreement two nuclear reactors of 1000 megawatts each would be built. As with the plans in Saudi Arabia and Egypt, construction of the nuclear power reactors is a complex undertaking and could easily take as many as 10 years. For Jordan, the reactors will provide badly needed cheap electricity. The three deals will earn Russia billions of dollars in new business, but it has been suggested that Russia and its new partners also have political goals in mind. The three Arab states involved in pursuing new paths of nuclear cooperation with Russia are all Sunni nations. The recently negotiated nuclear deal between the major powers and Iran, a Shiite, Persian nation, may have convinced the Arabs that Iran would one day become a nuclear weapons state. Civilian nuclear power, such as that which the Saudis, Egyptians and Jordanians are seeking, has been used in the past in other nations to serve as cover for an enrichment program, a direct path toward acquiring fissile material. This entry was posted in National Security and tagged Egypt, Jordan, Nuclear Energy, Russia, Saudi Arabia. Bookmark the permalink. Jack Caravelli served in the Central Intelligence Agency, the White House National Security Council Staff from 1996-2000 and then as Deputy Assistant Secretary at the Department of Energy from 2000-2003. He is the author of Beyond Sand & Oil: The Nuclear Middle East and Nuclear Insecurity.